Proprietary Name: Nafcillin What is the Proprietary Name? Non-Proprietary Name: Nafcillin Injection What is the Non-Proprietary Name? Nafcillin with NDC 67850-032 is a a human prescription drug product labeled by Methapharm Inc.. The generic name of Nafcillin is nafcillin injection. The product's dosage form is powder, for solution and is administered via intramuscular; intramuscular; intravenous form. FDA Application Number: ANDA090560 What is the FDA Application Number? Nafcillin for Injection, USP is semisynthetic penicillin derived from the penicillin nucleus,6-amino-penicillanic acid. 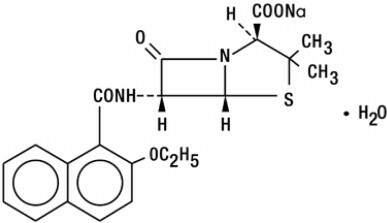 The chemical name of nafcillin sodium is Monosodium (2S, 5R, 6R)-6-(2-ethoxy-1-naphthamido)-3, 3-dimethyl-7-oxo-4-thia-1- azabicyclo [3.2.0]heptane-2-carboxylate monohydrate. It is resistant to inactivation by the enzyme penicillinase (beta-lactamase). The structural formula of nafcillin sodium is as follows:C21H21N2NaO5S ●H2O MW=454.47Nafcillin for Injection, USP for the intramuscular or intravenous route of administration, contains nafacilin sodium as a sterile white to off-white crystalline dry powder for reconstitution. The reconstituted solution is a clear and colorless solution. The pH of the reconstituted solution is 6 - 8.5. Nafcillin for Injection, USP contains nafcillin sodium as the monohydrate equivalent to 1 gram or 2 grams of nafcillin per vial and is buffered with approximately 38 mg sodium citrate per gram. The sodium content is about 66 mg [2.9 mEq] per gram nafcillin. In a study of five healthy adults administered a single 500 mg dose of nafcillin by intravenous injection over seven minutes, the mean plasma concentration of the drug was approximately 30 mcg/mL at 5 minutes after injection. The mean area under the plasma concentration-versus-time curve (AUC) for nafcillin in this study was 18.06 mcg・h/mL.The serum half-life of nafcillin administered by the intravenous route ranged from 33 to 61 minutes as measured in three separate studies.In contrast to the other penicillinase-resistant penicillins, only about 30% of nafcillin is excreted as unchanged drug in the urine of normal volunteers, and most within the first six hours. Nafcillin is primarily eliminated by nonrenal routes, namely hepatic inactivation and excretion in the bile.Nafcillin binds to serum proteins, mainly albumin. The degree of protein binding reported for nafcillin is 89.9 ± 1.5%. Reported values vary with the method of study and the investigator.The concurrent administration of probenecid with nafcillin increases and prolongs plasma concentrations of nafcillin. Probenecid significantly reduces the total body clearance of nafcillin with renal clearance being decreased to a greater extent than nonrenal clearance.The penicillinase-resistant penicillins are widely distributed in various body fluids, including bile, pleural, amniotic and synovial fluids. With normal doses insignificant concentrations are found in the aqueous humor of the eye. High nafcillin CSF levels have been obtained in the presence of inflamed meninges.Renal failure does not appreciably affect the serum half-life of nafcillin; therefore, no modification of the usual nafcillin dosage is necessary in renal failure with or without hemodialysis. Hemodialysis does not accelerate the rate of clearance of nafcillin from the blood.A study which assessed the effects of cirrhosis and extrahepatic biliary obstruction in man demonstrated that the plasma clearance of nafcillin was significantly decreased in patients with hepatic dysfunction. In these patients with cirrhosis and extrahepatic obstruction, nafcillin excretion in the urine was significantly increased from about 30 to 50% of the administered dose, suggesting that renal disease superimposed on hepatic disease could further decrease nafcillin clearance. Penicillinase-resistant penicillins exert a bactericidal action against penicillin-susceptible microorganisms during the state of active multiplication. All penicillins inhibit the biosynthesis of the bacterial cell wall. Nafcillin sodium has been shown to be active against most isolates of the following microorganism, both in vitro and in clinical infections as described in the INDICATIONS AND USAGE section.Gram-positive bacteriaStaphylococcus aureusSusceptibility TestingFor specific information regarding susceptibility test interpretive criteria and associated test methods and quality control standards recognized by FDA for this drug, please see: https://www.fda.gov/STIC. Nafcillin is indicated in the treatment of infections caused by penicillinase-producing staphylococci which have demonstrated susceptibility to the drug. Cultures and susceptibility tests should be performed initially to determine the causative organism and its susceptibility to the drug.Nafcillin may be used to initiate therapy in suspected cases of resistant staphylococcal infections prior to the availability of susceptibility test results. Nafcillin should not be used in infections caused by organisms susceptible to penicillin G. If the susceptibility tests indicate that the infection is due to an organism other than a resistant Staphylococcus, therapy should not be continued with Nafcillin for Injection, USP.To reduce the development of drug-resistant bacteria and maintain the effectiveness of Nafcillin for Injection, USP and other antibacterial drugs, Nafcillin for Injection, USP should be used only to treat or prevent infections that are proven or strongly suspected to be caused by susceptible bacteria. When culture and susceptibility information are available, they should be considered in selecting or modifying antibacterial therapy. In the absence of such data, local epidemiology and susceptibility patterns may contribute to the empiric selection of therapy. SERIOUS AND OCCASIONALLY FATAL HYPERSENSITIVITY (ANAPHYLACTIC) REACTIONS HAVE BEEN REPORTED IN PATIENTS ON PENICILLIN THERAPY. THESE REACTIONS ARE MORE LIKELY TO OCCUR IN INDIVIDUALS WITH A HISTORY OF PENICILLIN HYPERSENSITIVITY AND/OR A HISTORY OF SENSITIVITY TO MULTIPLE ALLERGENS. BEFORE INITIATING THERAPY WITH NAFCILLIN, CAREFUL INQUIRY SHOULD BE MADE CONCERNING PREVIOUS HYPERSENSITIVITY REACTIONS TO PENICILLINS, CEPHALOSPORINS, OR OTHER ALLERGENS. IF AN ALLERGIC REACTION OCCURS, NAFCILLIN SHOULD BE DISCONTINUED AND APPROPRIATE THERAPY INSTITUTED.Clostridium difficile associated diarrhea (CDAD) has been reported with use of nearly all antibacterial agents, including Nafcillin for Injection, USP, and may range in severity from mild diarrhea to fatal colitis. Treatment with antibacterial agents alters the normal flora of the colon leading to overgrowth of C. difficile.C. difficile produces toxins A and B which contribute to the development of CDAD. Hypertoxin producing strains of C. difficile cause increased morbidity and mortality, as these infections can be refractory to antimicrobial therapy and may require colectomy. CDAD must be considered in all patients who present with diarrhea following antibiotic use. Careful medical history is necessary since CDAD has been reported to occur over two months after the administration of antibacterial agents.If CDAD is suspected or confirmed, ongoing antibiotic use not directed against C. difficile may need to be discontinued. Appropriate fluid and electrolyte management, protein supplementation, antibiotic treatment of C. difficile, and surgical evaluation should be instituted as clinically indicated. Nafcillin should generally not be administered to patients with a history of sensitivity to any penicillin.Penicillin should be used with caution in individuals with histories of significant allergies and/or asthma. Whenever allergic reactions occur, penicillin should be withdrawn unless, in the opinion of the physician, the condition being treated is life-threatening and amenable only to penicillin therapy. The use of antibiotics may result in overgrowth of nonsusceptible organisms. If new infections due to bacteria or fungi occur, the drug should be discontinued and appropriate measures taken.The liver/biliary tract is the primary route of nafcillin clearance. Caution should be exercised when patients with concomitant hepatic insufficiency and renal dysfunction are treated with nafcillin. Serum levels should be measured and the dosage adjusted appropriately to avoid possible neurotoxic reactions associated with very high concentrations (see DOSAGE AND ADMINISTRATION)Prescribing Nafcillin for Injection in the absence of a proven or strongly suspected bacterial infection or a prophylactic indication is unlikely to provide benefit to the patient and increases the risk of the development of drug-resistant bacteria. Bacteriologic studies to determine the causative organisms and their susceptibility to nafcillin should be performed. (See CLINICAL PHARMACOLOGY, Microbiology). In the treatment of suspected staphylococcal infections, therapy should be changed to another active agent if culture tests fail to demonstrate the presence of staphylococci.Periodic assessment of organ system function including renal, hepatic, and hematopoietic should be made during prolonged therapy with nafcillin. White blood cell and differential cell counts should be obtained prior to initiation of therapy and periodically during therapy with nafcillin. Periodic urinalysis, blood urea nitrogen, and creatinine determinations should be performed during therapy with nafcillin. SGOT and SGPT values should be obtained periodically during therapy to monitor for possible liver function abnormalities. Tetracycline, a bacteriostatic antibiotic, may antagonize the bactericidal effect of penicillin, an coconcurrent use of these drugs should be avoided.Nafcillin in high dosage regimens, i.e., 2 grams every 4 hours, has been reported to decrease the effects of warfarin. When nafcillin and warfarin are used concomitantly, the prothrombin time should be closely monitored and the dose of warfarin adjusted as necessary. This effect may persist for up to 30 days after nafcillin has been discontinued.Nafcillin when administered concomitantly with cyclosporine has been reported to result in subtherapeutic cyclosporine levels. The nafcillin-cyclosporine interaction was documented in a patient during two separate courses of therapy. When cyclosporine and nafcillin are used concomitantly in organ transplant patients, the cyclosporine levels should be monitored. Pregnancy Category BReproduction studies have been performed in the mouse with oral doses up to 20 times the human dose and orally in the rat at doses up to 40 times the human dose and have revealed no evidence of impaired fertility or harm to the rodent fetus due to nafcillin. There are, however, no adequate or well-controlled studies in pregnant women. Because animal reproduction studies are not always predictive of human response, nafcillin should be used during pregnancy only if clearly needed. Clinical studies of Nafcillin for Injection did not include sufficient numbers of subjects aged 65 and over to determine whether they respond differently from younger subjects. Other reported clinical experience has not identified differences in responses between the elderly and younger patients. In general, dose selection for an elderly patient should be cautious, usually starting at the low end of the dosing range, reflecting the greater frequency of decreased hepatic, renal, or cardiac function, and of concomitant disease or other drug therapy.Nafcillin for Injection contains 66 mg (2.9 mEq) of sodium per gram. At the usual recommended doses, patients would receive between 198 and 396 mg/day (8.7 and 17.4 mEq) of sodium. The geriatric population may respond with a blunted natriuresis to salt loading. This may be clinically important with regard to such diseases as congestive heart failure. Patients should be counseled that antibacterial drugs including Nafcillin for Injection should only be used to treat bacterial infections. They do not treat viral infections (e.g., the common cold). When Nafcillin for Injection is prescribed to treat a bacterial infection, patients should be told that although it is common to feel better early in the course of therapy, the medication should be taken exactly as directed. Skipping doses or not completing the full course of therapy may (1) decrease the effectiveness of the immediate treatment and (2) increase the likelihood that bacteria will develop resistance and will not be treatable by Nafcillin for Injection or other antibacterial drugs in the future.Diarrhea is a common problem caused by antibiotics which usually ends when the antibiotic is discontinued. Sometimes after starting treatment with antibiotics, patients can develop watery and bloody stools (with or without stomach cramps and fever) even as late as two or more months after having taken the last dose of the antibiotic. If this occurs, patients should contact their physician as soon as possible. Body as a WholeThe reported incidence of allergic reactions to penicillin ranges from 0.7 to 10 percent (see WARNINGS). Sensitization is usually the result of treatment, but some individuals have had immediate reactions to penicillin when first treated. In such cases, it is thought that the patients may have had prior exposure to the drug via trace amounts present in milk or vaccines. Two types of allergic reactions to penicillins are noted clinically, immediate and delayed.Immediate reactions usually occur within 20 minutes of administration and range in severity from urticaria and pruritus to angioneurotic edema, laryngospasm, bronchospasm, hypotension, vascular collapse, and death. Such immediate anaphylactic reactions are very rare (see WARNINGS) and usually occur after parenteral therapy but have occurred in patients receiving oral therapy. Another type of immediate reaction, an accelerated reaction, may occur between 20 minutes and 48 hours after administration and may include urticaria, pruritus, and fever.Although laryngeal edema, laryngospasm, and hypotension occasionally occur, fatality is uncommon. Delayed allergic reactions to penicillin therapy usually occur after 48 hours and sometimes as late as 2 to 4 weeks after initiation of therapy. Manifestations of this type of reaction include serum sickness-like symptoms (i.e., fever, malaise, urticaria, myalgia, arthralgia, abdominal pain) and various skin rashes. Nausea, vomiting, diarrhea, stomatitis, black or hairy tongue, and other symptoms of gastrointestinal irritation may occur, especially during oral penicillin therapy.Local ReactionsPain, swelling, inflammation, phlebitis, thrombophlebitis, and occasional skin sloughing at the injection site have occurred with intravenous administration of nafcillin (see DOSAGE AND ADMINISTRATION). Severe tissue necrosis with sloughing secondary to subcutaneous extravasation of nafcillin has been reported.Nervous System ReactionsNeurotoxic reactions similar to those observed with penicillin G could occur with large intravenous or intraventricular doses of nafcillin especially in patients with concomitant hepatic insufficiency and renal dysfunction (see PRECAUTIONS).Urogenital ReactionsRenal tubular damage and interstitial nephritis have been associated infrequently with the administration of nafcillin. Manifestations of this reaction may include rash, fever, eosinophilia, hematuria, proteinuria, and renal insufficiency.Gastrointestinal ReactionsPseudomembranous colitis has been reported with the use of nafcillin. The onset of pseudomembranous colitis symptoms may occur during or after antibiotic treatment (see WARNINGS).Metabolic ReactionsAgranulocytosis, neutropenia, and bone marrow depression have been associated with the use of nafcillin.To report SUSPECTED ADVERSE REACTIONS, contact Methapharm, Inc. at 1-800-287-7686 or FDA at 1-800-FDA-1088 or www.fda.gov/medwatch. Neurotoxic reactions similar to those observed with penicillin G may arise with intravenous doses of nafcillin especially in patients with concomitant hepatic insufficiency and renal dysfunction (see PRECAUTIONS).In the case of overdosage, discontinue nafcillin, treat symptomatically and institute supportive measures as required. Hemodialysis does not increase the rate of clearance of nafcillin from the blood. Nafcillin for Injection is available for intramuscular and intravenous use.The usual I.V. dosage for adults is 500 mg every 4 hours. For severe infections, 1 g every 4 hours is recommended. Administer slowly over at least 30 to 60 minutes to minimize the risk of vein irritation and extravasation.﻿RECOMMENDED DOSAGE FOR NAFCILLIN FOR INJECTION, USP Drug Adults Infants and Children < 40 kg (88 lbs) Other RecommendationsNafcillin 500 mg IM every 4 to 6 hours. IV every 4 hours 25 mg/kg IM twice daily Neonates 10 mg/kg IM twice daily1 gram IM or IV every 4 hours (severe infections) Bacteriologic studies to determine the causative organisms and their susceptibility to nafcillin should always be performed. Duration of therapy varies with the type and severity of infection as well as the overall condition of the patient, therefore it should be determined by the clinical and bacteriological response of the patient. In severe staphylococcal infections, therapy with nafcillin should be continued for at least 14 days. Therapy should be continued for at least 48 hours after the patient has become afebrile, asymptomatic, and cultures are negative. The treatment of endocarditis and osteomyelitis may require a longer duration of therapy.Nafcillin-probenecid therapy is generally limited to those infections where very high serum levels of nafcillin are necessary.No dosage alterations are necessary for patients with renal dysfunction, including those on hemodialysis. Hemodialysis does not accelerate nafcillin clearance from the blood.For patients with hepatic insufficiency and renal failure, measurement of nafcillin serum levels should be performed and dosage adjusted accordingly.With intravenous administration, particularly in elderly patients, care should be taken because of the possibility of thrombophlebitis.Parenteral drug products should be inspected visually for particulate matter and discoloration prior to administration whenever solution and container permit.DIRECTIONS FOR USE For Intramuscular UseReconstitute with Sterile Water for Injection, USP, 0.9% Sodium Chloride Injection, USP or Bacteriostatic Water for Injection, USP (with benzyl alcohol or parabens); add 3.4 mL to the 1 g vial for 4 mL resulting solution; 6.6 mL to the 2 g vial for 8 mL resulting solution. All reconstituted vials have a concentration of 250 mg per mL.The clear solution should be administered by deep intragluteal injection immediately after reconstitution.Reconstituted StabilityReconstitute with the required amount of Sterile Water for Injection, USP, 0.9% Sodium Chloride Injection, USP or Bacteriostatic Water for Injection, USP (with benzyl alcohol or parabens). The resulting solutions are stable for 3 days at room temperature or 7 days under refrigeration and 90 days frozen.For Direct Intravenous UseThe required amount of drug should be diluted in 15 to 30 mL of Sterile Water for Injection, USP or Sodium Chloride Injection, USP and injected over a 5- to 10- minute period. This may be accomplished through the tubing of an intravenous infusion if desirable.For Administration by Intravenous DripReconstitute as directed above (for intravenous use) prior to diluting with intravenous Solution.﻿STABILITY PERIODS FOR NAFCILLIN FOR INJECTION, USP* Concentration mg/mL Sterile Water for Injection, USPSodium Chloride Injection, USP (0.9%) Sodium Lactate Solution USP (M/6 Molar) Dextrose Injection (5%)Dextrose and Sodium Chloride Injection USP (5% Dextrose and 0.45% Sodium Chloride) Invert Sugar Injection USP (10%)Lactated Ringers Injection USP ROOM TEMPERATURE (25o C) 10-200 24 hrs 24 hrs 30 24 hrs2-30 24 hrs 24 hrs10-30 24 hrs 24 hrs﻿REFRIGERATION (4o C) 10-200 7 Days 7 Days 10-30 7 Days 7 Days 7 Days 7 Days 7 DaysFROZEN (-15oC) 250 90 Days 90 Days 10-250 90 Days 90 Days 90 Days 90 Days 90 Days *IMPORTANT: This chemical stability information in no way indicates that it would be acceptable practice to use this product well after the preparation time. Good professional practices suggest that a product should be used as soon after preparation as feasible.Only those solutions listed above should be used for the intravenous infusion of nafcillin sodium, USP. The concentration of the antibiotic should fall within the range specified. The drug concentration and the rate and volume of the infusion should be adjusted so that the total dose of nafcillin is administered before the drug loses its stability in the solution in use.There is no clinical experience available on the use of this agent in neonates or infants for this route of administration.This route of administration should be used for relatively short-term therapy (24 to 48 hours) because of the occasional occurrence of thrombophlebitis particularly in elderly patients.If another agent is used in conjunction with nafcillin therapy, it should not be physically mixed with nafcillin but should be administered separately.